97 w w w . M o d e r n T i r e D e a l e r . c o m A U T O M O T I V E I N T E L L I G E N C E ( 855 ) 288-3587 autel.com / maxitpms.com Register and update tools for latest coverage © 2018 Autel Intelligent Technology Inc. TS508 98 % VEHICLE COVERAGE PROGRAMMABLE UNIVERSAL TPMS NOTE: Perform the tire pressure adjust- ment aer the tires have suciently cooled down. •e initialization is normally is com- pleted within two to three minutes. If the initialization has not been com- pleted successfully, DTC C2177/77 will be set aer approximately 20 minutes. Initialization can be terminated by connecting terminals 13 (TC) and 4 (CG) of the DLC3 (see Figure 1). During initialization, the tire pressure sensor measures the in'ation pressure of the tires, and registers the signals that are transmitted into the tire pressure monitor ECU at a frequency of one per minute. •e initialization process is completed when the signals from the tires (including the spare tire) have been received. •e initialization process is canceled if the ignition switch is turned to the OFF position prior to the completion of initialization. To restart initialization, the tire pressure warning reset switch must be pressed again. 1) Set tires to the speci•ed (cold) pres- sures as indicated on the tire and loading information label. 2) Turn the ignition switch ON. 3) Press and hold the tire pressure warn- ing reset switch for three seconds or more so that the tire pressure warning light blinks three times (one second on, one second o— ). See Figures 2, 3 and 4. 4) Turn the ignition switch OFF. 5) Connect the Techstream to the DLC3. 6) Turn the ignition switch ON. 7) Turn the Techstream ON. 8) Check the Data List. Enter the fol- lowing menus: Chassis / Tire Pressure Monitor / Data List. NOTE: It may take about two or three minutes until the values are displayed. If the values are not displayed aer a few minutes, perform troubleshooting according to the inspection procedure for DTCs C2121/21 to C2124/24. If the initialization has not been completed successfully, DTC C2177/77 will be set aer the vehicle is driven for 20 minutes or more. 9) Con•rmation that the initialization is completed is when the Data List "ID Tire In'ation Pressure" shows the correct tire pressures. 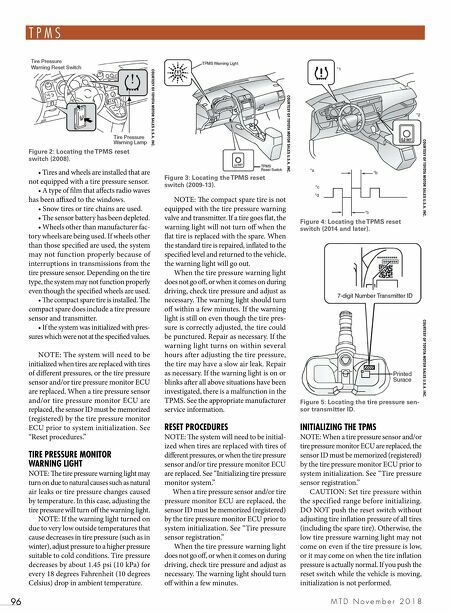 TIRE PRESSURE SENSOR REGISTRATION NOTE: When a tire pressure sensor and/or tire pressure monitor ECU are replaced, the sensor ID must be memorized (registered) by the tire pressure monitor ECU prior to system initialization. To perform this procedure, the Techstream must be used. It is not necessary to register the sensor ID(s) when only a tire rotation is performed. 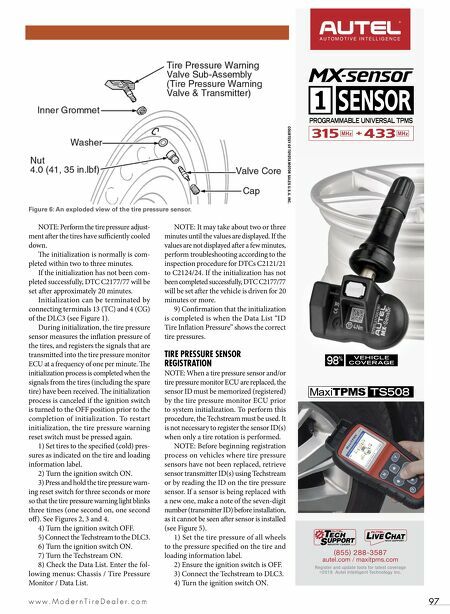 NOTE: Before beginning registration process on vehicles where tire pressure sensors have not been replaced, retrieve sensor transmitter ID(s) using Techstream or by reading the ID on the tire pressure sensor. If a sensor is being replaced with a new one, make a note of the seven-digit number (transmitter ID) before installation, as it cannot be seen aer sensor is installed (see Figure 5). 1) Set the tire pressure of all wheels to the pressure speci•ed on the tire and loading information label. 2) Ensure the ignition switch is OFF. 3) Connect the Techstream to DLC3. 4) Turn the ignition switch ON. Figure 6: An exploded view of the tire pressure sensor. COURTESY OF TOYOTA MOTOR SALES U.S.A. INC.